Lion Bill Liversidge, our contact person, usually collects on a monthly basis. On a good month he collects 8-10 pair of glasses which are delivered to Ray Dahl Optical who also holds used eyewear for the Sidney Lions. Once sufficient are collected to fill a large box, they are delivered to a centre in Winnipeg to be cleaned, repaired, the prescription read by a lensometer, catalogued, and forwarded to areas of need. 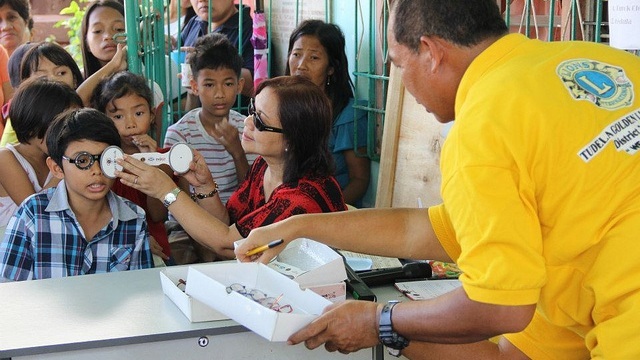 There clinic staff examine the patient and match their need to the donated eyewear. Bill says that on a visit to Quito he visited the Quito Central Lions Eye Clinic. His guide told him that he received his much needed glasses from the clinic and that his new glasses helped him with his studies. He hoped to become an architect. Sorry, no false teeth, canes or artificial limbs.